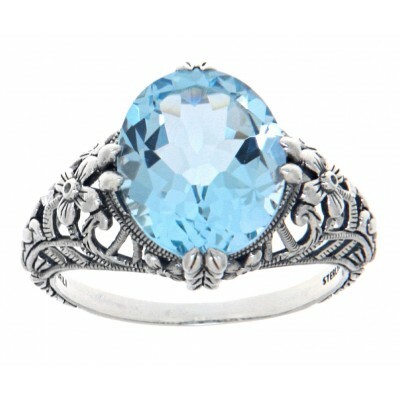 Beautiful Blue Topaz filigree ring features a single large oval cut genuine Blue Topaz gemstone, it is handcrafted and finished in intricate sterling silver detail. Filigree rings are timeless in style and can be enjoyed, cherished and handed down as precious family heirlooms. There are many colors of Topaz, Blue Topaz is sometimes used as the birth stone for the month of December along with Blue Zircon. 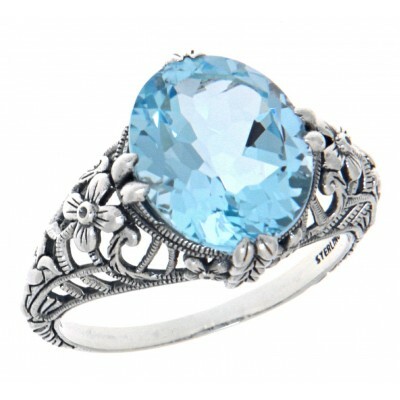 The Blue Topaz is also the suggested anniversary gemstone for the 4th, 19th or 23rd year of marriage. This ring is new and a quality sterling silver antique reproduction and comes with a money back guarantee. 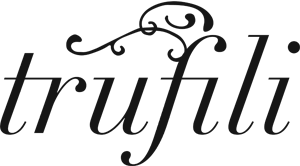 Please see our nice selection of fine Antique / Victorian style filigree jewelry.